On Friday morning I walked with other reviewers from the Burlington Hotel to Curzon Street Station and found my table waiting for me in a light and airy first-floor room showing the ‘Otherlands Exhibition’, certainly the most interesting of the shows in Curzon Street. Several of those included were names I recognised, and one in particular was Austrian photographer Reiner Riedler, with an unforgettable image showing Superman leaping through the air. In April 2006 when I was still writing for ‘About Photography‘ I did a short note on the Anzenberger Gallery in Vienna. The Anzenberger Agency was founded in 1989 and represents photojournalists, documentary photographers and portraitists, selling their work to clients including The New York Times, National Geographic, Geo, Stern, Vogue, New Yorker, Aperture and Le Monde. In 2002 they decided to open a gallery, and when I looked there was work by around 20 photographers on the site. Among those I mentioned as of particular interest was Reiner Riedler (b 1968, Austria), with work from Russia, the Ukraine, Albania on show. Since then I’ve seen some of his work – including the above image – in magazines. It came as a welcome surprise – and a rewarding start to the day, when my first visitor (as a late booking not on my schedule) was Riedler with a portfolio of his work on ‘Fake Holidays‘, pictures in theme parks and similar venues around the world. It’s hard for any photographer to resist taking pictures of these places, but very difficult to produce the sustained level of work that Riedler has. Looking at his images, as well as dealing with the obvious commercial surreality, he has found various ways to invest them with other layers of interest, including the humour of the Titanic Hotel as a shark about to swallow the unsuspecting swimmers in the pool or the slight resemblance in the stance, gesture and features of a man perhaps about to be pounced upon by a dinosaur and that prehistoric creature, or in the menace of a cloud of insecticide spray. Sometimes the focus is on the customers, sometimes on the costumed animators and at other times on the artificiality of the structures themselves. In his images of the indoor “Tropical Islands” pool in Berlin, things could almost be real until you notice the join in the background sky. Of course photography is itself an illusion, producing simulcra of the world, (the postcards gathered and produced proudly by Michel-Ange and Ulysees in Godard’s ‘Les Carabiniers‘.) In the artificial environments Riedler has photographed, capitalism has taken simulcra into a further dimension and peopled them with real people, but they still lack reality, flawed copies. 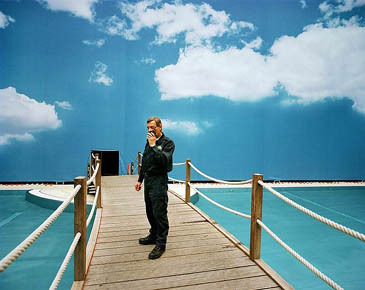 His photographs add a further layer, usually adding a reality which their subjects lack. 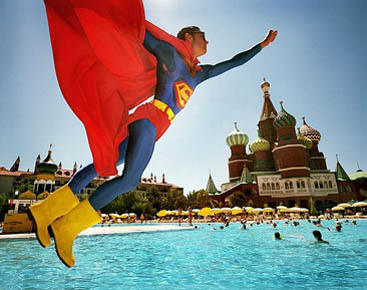 His superman image above is atypical, in that it works playfully with the fantasy rather than subverting it, reminding me a little of some of Argentine photographer Marcos López’s kitsch Pop latino work. This entry was posted on Monday, August 13th, 2007 at 05:31 pm and is filed under Photographers, Reviews etc. You can follow any responses to this entry through the RSS 2.0 feed. You can leave a response, or trackback from your own site.